You can't accuse California-based Tintri of choosing an ill-fitting name: it literally translates to "lightning" in Irish Gaelic, which begins to make sense when you discover that the company sells a flash-centric storage solution that it claims offers powerful and fast performance at a wallet-friendly price. Tintri was co-founded in 2008 by its President and CEO Ken Klein, and Kieran Harty, who ran engineering at VMware for seven years beforehand. While working for the virtualization giant, Harty noticed that its customers were seeing benefits from virtualization on the compute side, but less so on storage, which was proving a huge "pain point". Tintri's main offering, VMstore, is a VMware-compatible, storage-focused rack-mount appliance that uses commodity SSDs and offers features such as 10GbE connectivity and cross-platform hypervisor support. According to Harty, the company is going after NetApp's virtualization lunch with the solution, which can scale from 100 virtual machines (VMs) to more than 100,000. Harty reckons that Tintri's solution can "learn and adapt" to an organisation's storage needs by quite literally teaching VMs sitting on the same storage to operate alongside each other in a more efficient manner. We spoke to Harty at VMworld Europe 2014 to find out more. TechRadar Pro: Why was storage ripe for disruption when Tintri first went to market in 2011? Kieran Harty: Storage has been a technically very boring area for a long time. I remember the last innovation that really occured, which was back with Netapp, and then [EMC] Isilon in the early 2000s. It was really two things that were happening at once: one was what virtualization was doing to storage, and then there were the hardware innovations happening around flash memory, multi-core processors and the availability of 10-Gigabit Ethernet, which you could use instead of fibre-channel. So it was the software changes, and then the hardware changes. TRP: Would you class your VMstore storage appliance as a hybrid solutions or all-flash array? And what's the benefit of the flash component? KH: It includes flash and hard disk, and I would characterise it as a flash-centric solution, which is the term we use. Basically it would give you the performance of an all-flash system but with the economics of a hybrid system. So one of the things that distinguishes us is that almost all - 99% or more - of the I/O happens from flash. In a conventional hybrid system you'd get maybe 70 or 80 per cent. 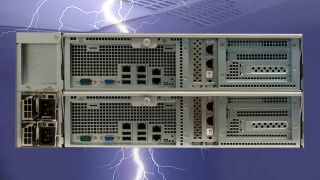 We think you can get the performance of an all-flash system today without having the cost of one. TRP: Is that because the cost of flash has come down? KH: Yes - we're using commodity flash - you probably have a flash drive in your laptop. We're using those kinds of technologies and are working around some of the limitations in software. But it's still a lot more expensive than hard disk, which is why we think that for cold data, snapshots and replicas, you actually want to store those things on hard disk as opposed to flash, while not having to worry about placement issues or anything like that. TRP: How does VMstore handle storage differently to your competitors? KH: We use the term that our storage is smart, sees, learns and adapts. That means that in a traditional storage environment, it's very difficult to see what's happening at the VM level. It's an incredibly common problem that people encounter within IT environments. You may have an application that's running slowly, and you don't know why. Within traditional storage you have very little visibility as to what's happening on the storage side. In contrast, our smart storage understands virtual machines - you can see everything down to the virtual machine level and you can get end-to-end performance on an individual virtual machine. So you can see if it's the network, storage or host that's running slowly.